Having gone public in 2007 (NASDAQ: CHEF), The Chefs’ Warehouse, the nation’s premier specialty foods service distributor, sought to create regional distinction while retaining corporate cohesion. Create a customer-purveyor content distribution channel interconnected with social media to transmit regional product awareness, education, and availability. In 3 years, our reach now expands to over 1/3 of CW’s national reach, our distribution has climbed 857% from 1,500 to 12,870, and the publication has grown 300% from 12-pages to 36. 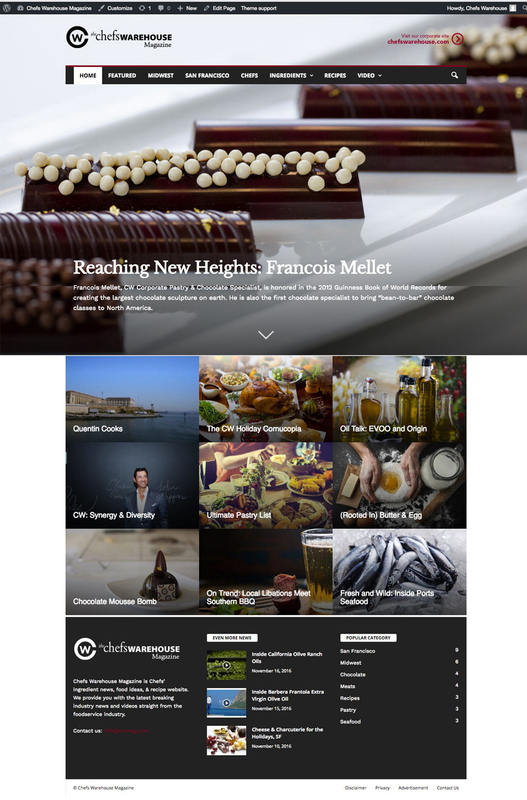 The Chefs’ Warehouse Magazine launched in November 2016 with its digital imprint, CWmag.com. Starting in San Francisco and the Midwest, we now cover the west coast, including Los Angeles, Las Vegas, SoCal, NorCal, Portland, Seattle, and Canada. Next up? National.